All of our Sky Dance Tour offerings are available for you to view below, just click on your selected Tour for more details. There is more than one page of Tours available, use the arrows at the bottom of the page to navigate. If you know what Tour you want, use the search function. Not seeing the Tour destination you want exactly then give us a call and we can work out a Tour for you personally. All Sky Dance Tours depart Archerfield Airport, Brisbane unless privately chartered. Don’t forget to check out our optional extras for the Sky Dance premium experience. Tours maybe booked online or over the phone, 0439 181 711 (Australian calls) or +61 439 181 711 (overseas calls). Many of your questions are answered on our Frequently Asked Questions page. Experience the wonder of flight and an introduction to the Sky Dance Adventure with a Brisbane City scenic flight. This is an absolutely stunning flight and seeing the Brisbane area from the sky is an absolute must do for anyone living here or traveling through. This Sky Dance Airborne Adventure takes you to see Brisbane City from new heights - An all-inclusive Sky Dance adventure to remember! Discover Brisbane City, Southbank, the Brisbane River, and beyond! 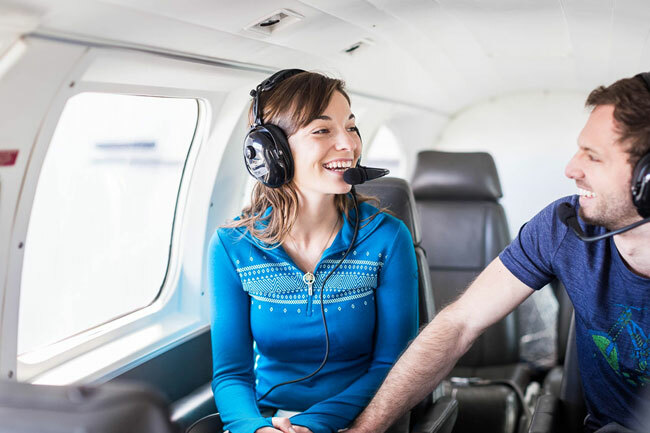 The Bay Island Tour departs from Archerfield Airport and takes you to explore the archipelago of inhabited and uninhabited islands that make up Moreton Bay! Mt Warning and the Border Ranges are by far the most spectacular of any Scenic Flight in this part of Australia. Fly into a lost world with unmatched perspective on the geological beginnings of theses incredible mountain ranges. Escape from the city and fly to the Bunjurgen Estate Vineyard, home to some of the best wines and ports in the area. Experience a hand-selected range of wines, meats and cheeses along with a breathtaking scenic flight through remains of an ancient volcanic crater. Hiking, Rock Climbing, The Magic of flight...This Sky Dance adventure will put you outside of your comfort zone and challenge you to explore your limits! Fly from Brisbane (Archerfield), hiking, rock climbing, and flying - an adventure to remember! Discover Moreton Bay and Stradbroke Island with a breathtaking flight and day of adventure with 'barefoot Dave' on Stradbroke Island. The Stradbroke Island Adventure is one of the most incredible ways you can experience what this beautiful area has to offer. We think it's time for a great weekend away, don't you? Join us on an adventure through the wine capital of QLD, Stanthorpe - quite the drive, but just a short flight away. 5 star food, wine, Australian culture, and the beautiful Girraween and Bald Rock National Parks. This is your opportunity to become involved in the 2018 Hummingbird House Charity Air Safari as part of a multi-aircraft formation departing Brisbane West Wellcamp Airport bound for the best of Queensland’s spectacular outback treasures! Find your dream adventure today! We are a passionate adventure company based in Brisbane, Australia. We deliver outstanding experiences to our guests, flying to some of the most beautiful and inspiring places in the country! Drop us a line if you don't see what you are looking for and we can work some custom magic happen for you. Sky Dance shared a post. Sky Dance shared a photo.